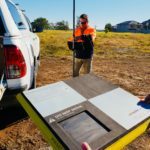 Abax Constructing Pty Ltd has reaffirmed its leadership in the provision of state of the art construction services, being the first company in Australia with Trimble Stratus drone technology. Western Earthmoving of Sydney, Australia, is empowering its field managers with access to the same digital positioning information used by its surveyors. Now the company’s whole team is unified in eliminating uncertainty, saving time, and increasing productivity. Boral recently oversaw the asphalt paving works of the A$160 million NSW Ports’ Intermodal Logistics Centre at Enfield in southwest Sydney, Australia. The facility will have a throughput capacity of 300,000 TEU per year, moving in and out of the site. Doing so productively and safely requires a design with a very uniform surface and a minimum slope for effective surface water drainage.